Happy Monday! Happy April! Spring is in the air–finally! I got to spend a few days in Puerto Rico in March, and that simply wetted my appetite for warmer temps. Let’s talk about reading today. First of all I can’t remember a time in my life when I wasn’t reading a book. I’ve gone through seasons of reading certain genres for long periods of time. I’ve gone through periods of reading 2 or 3 books at a time. I’ve gone my whole life reading fiction, until recently I’ve started reading non-fiction. What a blessing! But, this blog is about fiction, and specifically Christian Fiction. I have a friend, who will remain nameless, who I’ve featured on this blog before. She is an incredible writer. She only has 1 book out right now, (and 1 novella) but she’s been working on another book with an incredible title. (I’m sorry I can’t share the title.) I really wanted to read the book on the title alone, but then I remembered how amazing her writing is, and knew I would read no matter the title. I’m in the process of reading the final draft of her book now. It doesn’t disappoint. It’s intriguing and special, and lyrical, and romantic! I’m sorry to tease with all this info, but hopefully I’ll have her on the blog again when this book comes out. 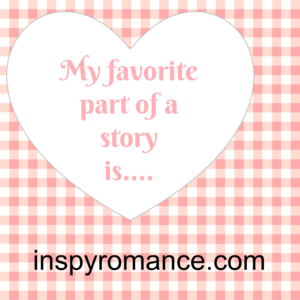 I know we talk about reading on this blog, but today let’s focus on favorite parts of stories. Breaking it down we have 3 parts of a story. Beginnings. Ah–first meets. The source of angst is revealed, the reasons why the hero and heroine will never be together thoughts swirl in both their minds. At odds with each other internally and externally have us readers rooting for their happy ever-afters. Middles. Yes, the author’s sometime nightmares are some readers favorite part of the story. Where all those angsts come into play into ways that are often surprising to our hero and heroine. The part where a light of hope shines through the messy middle and reveals secrets, pasts, and future promises. Thank you for taking part in the poll. I know I always love talking books and stories and sharing my favorites with people. In the comment section tell why you chose your answer on the poll. I’ll give away a $10 amazon gift card to one commenter. Since we are talking story, my first published story, Her Best Catch, is on sale through April 15th! I love the beginnings. It’s the whole experience of expectation. A great author will ensure that the beginning holds me in it’s grip and makes me keep on turning page after page. Hi Lindi! What a thought provoking blog. Can’t wait to read all the answers. My answer was the middle, but I think it depends on the author and the story. An attention getting beginning is needed to get a reader into the story, but often the blurb and cover gets my attention. The middle is the meat of the story – the conflicts, the unexpected twists and turns in the plot that I, the reader do NOT see coming that keeps me reading. The mystery of will I figure out the ending or will their be own last bomb shell that I, the reader could not predict. In romance stories the ending is predictable – the meeting of two loves, the happily ever after. As a reader we just don’t always know or can predict the how, when, where, or why of the ending. Spring has finally sprung in Michigan. Temperatures in the fifties and sixties. Last night we had a real spring thunderstorm. The grass is finally getting green. Daffadils are beginning to bloom. Best wishes. Renate—Yay for spring—green!! And flowers. I love your answer. One thing I do as an author, to hopefully keep the middle going, is I keep asking the question, “How can I make my hero/heroine more miserable?” Ha–but truth–I usually find plot points that I can expand if I keep asking the question. I chose middles, Lindi… I enjoy the journey the best! Go Renate!! The middles are challenging, yet intriguing. They keep the story moving in a great direction. Definitely getting cooler here, but we have had some rain which is a HUGE blessing. Wemble–Praise God for your rain. We’ve had too much rain here in March, but are settling into April with some sunshine. And again, thanks Renate!! I am torn between middle and ending. This is jard. I love happy endings but I also know that I’m reading romance so the ending will be a happy one, which makes me appreciate middle of the story more. One reason I write romance is because of the happy endings. And your comment is so true about the middle. The more the hero and heroine go through in the middle the more I appreciate the happy ending. I have put down 2 books I though I would like recently because the author failed to convince me in 50-75 pages, lack of interest or credibility. Endings are the icing on the cake where I get all the yummy satisfaction! And bonus points if there’s an epilogue!! Middles can be hazardous, the place where a story can really sag if a writer isn’t careful. Sometimes I’ll read a book and wonder if the word count was swaying the story, before the actual plot picks up momentum again. Thanks for the discussion, when I’m not reading books I like talking about books! Tracey–great insights here! I love how you give authors 50 to 75 pages. That’s a good segue—I hope we are hooked by that amount of writing. And what a good point about word count. I know what you mean. I heard author Cindy Woodsmall, (Amish genre) give a talk years ago talking about what she called the Teacup Theory. She said her characters didn’t so much as pick up a teacup if it didn’t matter/move the story foward/make a point/show a character quirk. I always keep that in mind when writing. Words have to count. I chose ending because I used to read the ending to make sure it was happy before I read the rest of the book. I don’t do that anymore. But I still anticipate the ending. It was a tough call though. I enjoy all the parts and the beginning has to get me hooked. God bless! I enjoy the middle part of story best because that is where the adventure transpires. It sometimes feels like I am on a roller coaster as the author weaves their twists and turns for the reader to follow. The constant anticipation of how it is going to turn out can be quite exhilarating! Susan—what a great analogy with the roller coaster. Ah–that’s how I want readers to feel as they read my books. I just finished one with that feeling. It’s the best! I like the middle because by then I’m really into the story and wanting to find out what’s going to happen and how issues are going to be resolved but there is still a good chunk of the book left (which is always a good thing, in my opinion). I’m with those who said, “beginning.” It’s a whole new adventure stretching before you. Even when endings are happy, I’m sad because the adventure is over. Merrillee—I love that you said you’re sad because the adventure is over. Just experienced that with a book. Beginning for me! Sometimes in a suspense book, I PEEK at the ending to see WHO did it?! How is the pollen count in your part of GA?? It is very high in my part of GA! Hi Jackie—Yay for beginnings, and boo for peeking! (Just kidding. :)) The pollen count is high here. Praise be to God I’m not affected by it. I know so many are. This morning it was like I had a fine layer of snow on my windshield, but it was pollen. We are in NW Ga.
A post to make me think today. LOL Tough one today. Well I had to name all three sections. Sometimes it depends on the writer, sometimes it depends on the genre. I just love all three sections. So I am sorry if I cheated the poll. Lori–A great observation. You in know way cheated the poll! I love your insight. I picked the middle because in the beginning, I am in a hurry to find out what’s happening and if it’s a good book, I don’t want it to end. Great reasoning, Ellie. Such true statements. I always love the beginnings to see what’s happening. I am late and honestly I am not sure what my favourite part is. You can’t have a book without a beginning and its what gets me into the book so if its not good I don’t keep reading. Then the middle keeps me there and makes me want to keep going but I guess I love finding out what happens in the end. It can also depend on the story if its a mystery or a LIS type I want to know how the baddie is dealt with and then what happens. Jenny—Hi!! No worries on being late. :) All you said is true. The different parts are special for different reasons. And like you, I’m looking for who the bad guy/girl is at the end of a mystery or suspense. Just a follow up comment to let you know the winner of the poll is….. Thank you everyone for participating. We do love our endings!